Depending on how they are structured, the economic impacts of the two policies are equivalent. They raise the price of fossil fuels. There are interesting debates to be had about their relative merits, but that’s for another post. What political advocates of carbon pricing fail to discuss much is that carbon taxes work by raising the price of fossil fuels to the point that consumers will switch to renewable fuels because they are cheaper. Carbon pricing works, if it works at all, not by making renewables cheaper, but by making fossil fuels more expensive (relative to current market prices). There is nothing wrong with this economically — as Roberts points out, carbon pricing is needed because of the colossal failure of markets to price in the global climate externalities of fossil fuels. But what price would it take to achieve a 40% or 80% reduction in fossil fuel consumption? In other words, what price for a gallon of gas would get American consumers to consume 80% less of it? Public discussions of carbon pricing don’t usually put a number to it. Bernie Sanders certainly doesn’t say how much of a carbon tax he would propose. The only study I have been able to find was produced by the National Association of Manufacturers, so take it with a grain of salt. But the NAM study concludes that a 40% reduction in carbon emissions would require a $100 per ton carbon tax, while an 80% reduction would require a $1,000 per ton carbon tax. According to the study, that would correlate to about $15 per gallon for gasoline. Despite the biases of the source, that sounds about right to me — gasoline demand is highly inelastic. Fifteen dollar gas is probably what it would take to get us to stop burning the stuff. For the record, I am firmly in favor of $15 a gallon gasoline, and 2050 is way too late — we will need that level of incentive by 2030 or so at current carbon emissions rates. Fifteen dollar gas by 2050 does not sound like a Presidential platform, even among the climate activist wing of the Democratic party. Cap-and-trade, even if it gets put back on the table, would lead to the same price point for an 80% reduction. Which is why I think these debates about carbon pricing, cap-and-trade, and taxes makes for interesting discussions among academics and policy wonks, but is just not going to happen politically until climate change is way beyond policy debates about economic tools. At that point, we are just going to have to ban the stuff, or continue to suffer the consequences. I do find the idea of a carbon tax return intriguing, however. Encouraging people to take a look, once a year, at their carbon emissions might have a bigger impact on reducing those emissions than the actual tax. 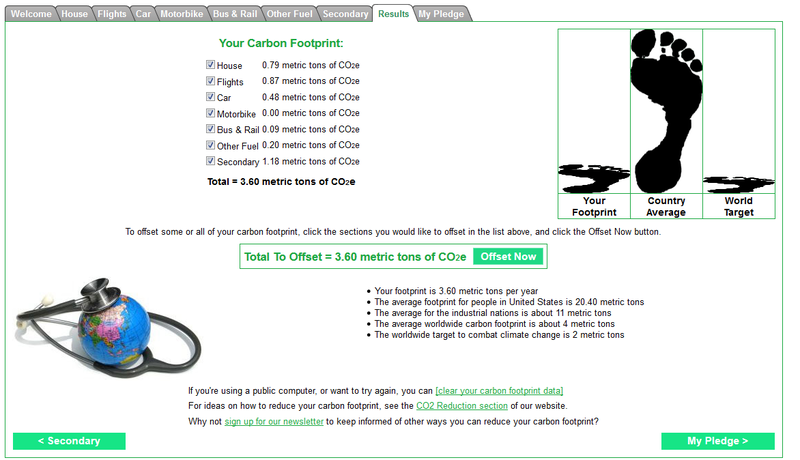 I totaled my emissions for 2015 using the calculator at CarbonFootprint.org. My personal goal is to live a comfortable life with a carbon footprint of less than four tons CO2E per year – about an 80% reduction from the average US individual carbon footprint. I am blogging about this on my personal blog. For 2015, I met my goal comfortably despite some international travel and plenty of life enrichment. But, carbon taxes would be collected upstream of the consumer, so we can’t look forward to (or dread) the forced introspection of an individual carbon tax return . . .